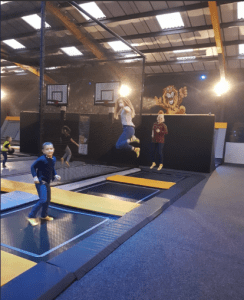 Just before Christmas we decided to do something different and go visit the local attraction “Air Jump Trampoline Park” in Orpington. It was a wet and windy day in early December, perfect for an indoor activity. I had looked on Trip Advisor reviews before our trip and lots of people had mentioned there were limited parking spaces but I found one straight away and we hurried inside out of the rain. As we signed up and got our special socks we were led to the safety video screening area where they explained the rules. After reminding the kids they were not to jump on the same trampoline as each other we made our way to the arena. Each session was an hour long so we waited for the previous customers to finish their booked time slot and had a look at all the different areas of the arena. The children pointed out the massive air bag and I couldn’t wait to get in there and I’m twenty five years old! Two Air Dunk basketball nets, loads of trampolines and a cool buzzer game at the back. There were so many activities we couldn’t wait to get started. As our time arrived we stuck together as a five, three adults and two children and started to jump. I thought I would get tired pretty quickly but it was so much fun and seeing the kids faces made me want to carry on for the full hour. We admired the other children able to do the flips and awesome jumps and as we needed a little rest and a drink at times we were able to come off and go to our locker and go straight back on again without any hesitation from the staff. I tried to take pictures on my phone of all of us but we were jumping so high up in the air my twenty eight pictures turned out to be pretty blurry. I thoroughly recommend going to this fabulous jumping experience. I haven’t stopped giggling in ages. 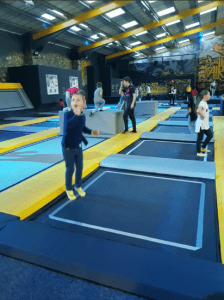 AirJump are proud to announce the opening of our first Trampoline Park. We believe in the importance of a healthy lifestyle and more importantly family time, so we have merged them together to create a park that everyone can enjoy and stay fit at the same time. After finding the perfect location in Orpington, we have been working hard to transform 14,000 square feet into a ‘first-rate’ trampoline experience with newest park facilities for our customers, whilst bringing something to the community that everybody can enjoy from all age groups and abilities. – Tony and Daniel Locke. Directors, AirJump Trampoline Park.